The mother of a severely epileptic nine-year-old wept when cannabis she tried to bring in to the UK illegally was confiscated at the airport today. 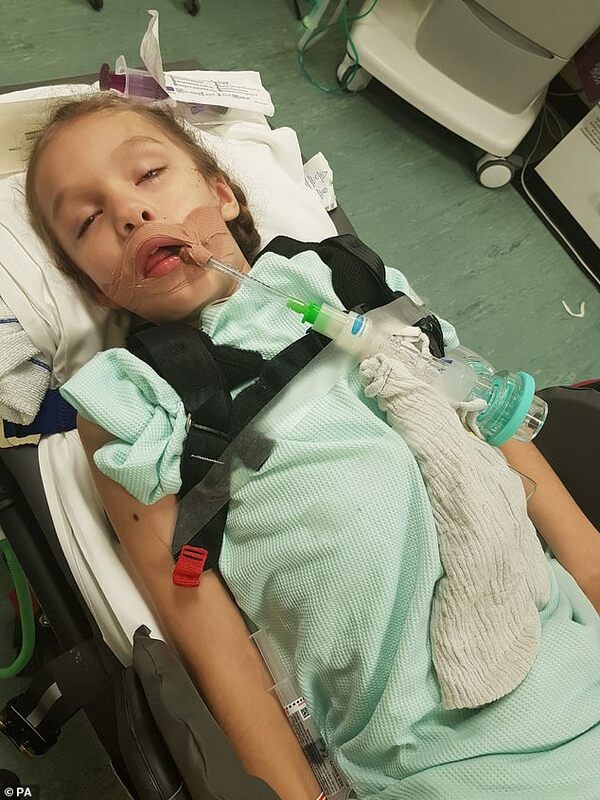 Emma Appleby, from Aylesham near Dover, flew back to Britain from Holland on Saturday morning with her partner Lee and a supply of medical cannabis oils for nine-year-old Teagan. But the three-month supply of medicines, which cost £4,600, was seized after the family landed at Southend Airport in Essex. Teagan suffers from a rare chromosomal disorder called Isodicentric 15 as well as Lennox-Gastaut syndrome, which causes up to 300 seizures a day. She suffered a seizure while on the plane. The family flew out on Thursday, got the medicine prescribed by a paediatric neurologist at the Erasmus Hospital in Rotterdam, collected it from a pharmacy and paid using their own and fundraised money. Three double blind randomised controlled trials have proven CBD, an element found in cannabis plants, can reduce the number of seizures for those with Dravet and Lennox Gastaut syndromes. Ms Appleby was comforted in Southend Airport's terminal building by fellow campaigner Hannah Deacon, who last year became the first to be allowed to bring THC oil through a UK airport legally for her seven-year-old son Alfie Dingley, who has epilepsy. NHS England guidance says it expects that cannabis-based products for medicinal use should 'only be prescribed for indications where there is clear published evidence of benefit' and in 'patients where there is a clinical need which cannot be met by a licensed medicine and where established treatment options have been exhausted'. Health Secretary Matt Hancock said in the Commons last month that his 'heart goes out' to parents experiencing anguish over difficulties in obtaining medicinal cannabis. He said he is working to 'unblock' some of the challenges in the system but, ultimately, 'these things need to be clinician-led'. Ms Appleby, who has met Mr Hancock, said she had no choice but to seek medical cannabis outside the UK. But the items were taken from her at the airport. 'I'm really gutted,' she said. 'They just took everything. 'They knew apparently, they had been notified from social media. 'I hadn't said where we were coming in but obviously everyone knew, all you've got to do is put it on the passport. 'They asked me at border control how long we were away for. 'I thought 'They're asking questions as someone's notified them'. She said border staff were told not to destroy the medicine but to seize it and hold it, and she hopes to apply for an import licence to get it back. Tory MP Sir Mike Penning, co-chairman of the All Party Parliamentary Group (APPG) on Medical Cannabis Under Prescription, said: 'This is a shattering blow for Emma and Teagan. 'It's a damning indictment of the way this policy has been implemented. 'I will be urging all my parliamentary colleagues to get this medicine returned to Emma soonest and demanding that the Department for Health, the NHS and everyone involved gets together urgently so families don't have to go through the stress and trauma of travelling abroad to get a medicine that is now legal here. Peter Carroll, director of the campaign group End Our Pain, said no family should go through what Emma, Teagan and Lee have been through. 'This is a medicine that's legal in the UK,' he said. 'The law was changed for a reason. 'It was changed on scientific advice as well. 'To put these families who have already got this stress and worry of caring for very sick children through all the trauma - Emma has been passed from pillar to post, she's tried to do the right thing at every stage of this process. 'I call on everybody from Matt Hancock, the leaders of the NHS, the leaders of all the medical professions, I know you must all be caring people but the system that you have put in place is resulting in this kind of trauma for families like Emma's. 'It's totally wrong. It's time now for compassion to dictate what happens next and we'll be unstinting in our fight to get this medicine back for Emma and, just as importantly, to make sure this doesn't happen for any other family. Mr Carroll said the Home Office had been approached for an import licence on compassionate grounds to help Teagan ahead of the journey but this had been refused. Ms Appleby's MP, Conservative Charlie Elphicke, has been pushing the Home Office to grant a licence for cannabis oil treatment for Teagan. A Government spokesman said: 'The decision to prescribe cannabis-based products for medicinal use is a clinical decision for specialist hospital doctors, made with patients and their families, taking into account clinical guidance. 'It is unlawful to import unlicensed cannabis-based products for medicinal use to the UK without the prescription of a specialist doctor and a Home Office importation licence. What are the laws regarding medical cannabis? Medical cannabis cannot be prescribed by a GP - only a specialist. Home Secretary Sajid Javid made it possible for people to buy cannabis legally for medical reasons last November. The low numbers actually being prescribed medical cannabis is due to problems with persuading specialists that cannabis is the right option, obtaining licenses for cannabis-related products, and even transporting them once they're in the UK. Interim guidelines were devised by the Royal College of Physicians and the British Paediatric Neurology Association in less time than specialists are usually given. The law made no restrictions on the kinds of products that can be prescribed but they cannot be smoked. So far a key issue has been creating guidelines as cannabis was labelled a class A drug with no medical value in the past. Cannabis is currently treated as a Class B drug under the Misuse of Drugs Scheduling Act of 2001.